As fall weather brings cooler temperatures to Maine I’m reminded of what my Grandma took to bed to keep her feet warm at night. Until he passed it was Grandpa, but that solution is too obvious and not what I had in mind. Grandma was born in the late 1800’s at a time before electric blankets, and the old ways of keeping warm in frigid Maine weather stuck with her into the 1960’s. The old wood stove was a source for transportable heat moved about in a variety of containers. One example is the clunky irons for ironing clothes predating the invention of electricity. Some of those may still be found serving as doorstops. The iron was heated on a stovetop and reheated as necessary until the ironing was done. As a side note, other retired irons became rope and pulley gravity weights for automatic outhouse door closers. Nowadays you’d be hard pressed to see one in action. If a two-seater and occupied you may not care to witness this oldtime version of the modern chat room. Anyway, the stove heat could be used in other ways, too. The first time seeing Grandma’s bedtime routine for keeping her toes warm left a lasting impression. In later years she used the old fashioned hot water bottle made out of thick rubber with a water tight stopper. However, in the 1950’s she revealed an even older secret when she opened the oven door to show off two bricks baking. These were standard size bricks like those used to make a brick house, and were heated until ready and then wrapped in a cloth which was placed under the covers. Layers of blankets and quilts provide insulation for holding heat, but in an unheated home the bed is still frigid when you first jump in. Those baked bricks allowed Grandma to keep her feet comfortable while the rest of bed became warm and cozy. 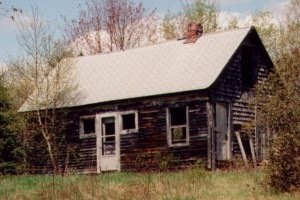 Years later I took a souvenir brick from the home my great great grandfather built in the 1800’s on what is now Degerstrom Road in Monson, Maine. The brick was discovered in the cellar when my brother and I found the abandoned and rundown home while investigating our family history. Wish now I had two.